This is the best I could do for a picture in a pinch. 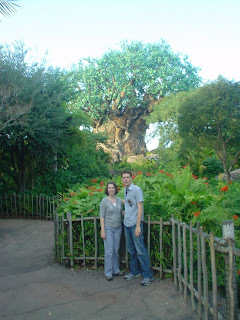 Us at Animal Kingdom. It was super fun, though Matt is not smiling. Since I last posted here, we've been to Florida and back, then a day trip to South Carolina, and to Virginia for a few days at Christmas. My in-laws came for a brief visit and Friday we leave to see my parents in Georgia. I've been working and Matt's been enjoying his break from school, which ended today. We're praying 2008 will be a great year for you, my family and friends, and for us too. We have a buyer interested in our house, so we're praying this time everything works out. If not, we know God is faithful and He's always provided so lovingly.